My computer is taking a very long time to shutdown. Is there a program I can use to track how long it takes to shutdown? Windows provides Performance Counters as well as Event Tracing which allows applications to do performance analysis so that one can pin-point the cause of performance problems, amongst those that exist there is one outstanding toolkit: The Windows Performance Toolkit available in the Windows SDK. In this toolkit you will find xbootmgr.exe, meant for Windows On/Off Transition Performance Analysis. Download the Windows SDK, then install the Windows Performance Toolkit using it. If you want help in the future, you can type xbootmgr -help as well as xperf /?. After the boot, it will generate a trace within two minutes. The trace has been saved in %ProgramFiles%\Microsoft Windows Performance Toolkit, you can drag it onto xperf.exe and it will be opened in a GUI. You will see a GUI with different graphs, the arrow at the left side allows you to add/remove graphs. Look at the graphs and see if you can identify anything out of the ordinary, you can select an interval and zoom in on it if you want to. Right click and unzoom when you want to see the whole. For each graph, you can right click to get summary tables for the currently selected interval. In these tables, sort by weight or by time to figure out which it is spending the most to. Please note that you can drag around columns, so for example the I/O table allows you to check out the highest using process as well as the highest using path. The divider (a yellow header column) makes it so that the columns right of it show the total for the columns left of it. So, if you have Path first and then Process, then you can open the tree for a file to see what processes have accessed it and then you get the totals for that process/file combination. You can find more information on how the graphs and tables function here. Please note that DPCs are Deferred Procedure Calls and Interrupts are Software Interrupts, both are related to drivers / hardware. My shutdowns where taking a long time to run. What follows is my example with Tom's answer. My shutdown is taking over a minute and it's all hard-drive I/O. 56.4 seconds of my shutdown was spent by WinInit writing 6.7GB to C:\hiberfil.sys. But the question is why is Windows writing to my hibernation file on shutdown? Now 9s of the 22s shutdown is spent by System writing to some unknown file. That might be worthy of more investigation. But for now i've solved my minute and a half shutdown. i went further and solved my 22s slow shutdown. From t=12s to t=21s showed 100% Disk Utilization, but zero Disk I/O. It was baffling. Until during one shutdown i heard the familiar sound of one of my drives spinning up. The shutdown was stalled for 9 seconds because Windows was attempting to access a disk that had gone to sleep. Nine seconds later the drive responds, and a moment later the machine turned off. Ironic that Windows wakes up a disk to tell it that it's time to go to sleep. That would make my actual shutdown 13.5 seconds. That might be worth more investigation. But for now i've solved my 22 second shutdown. Not the answer you're looking for? 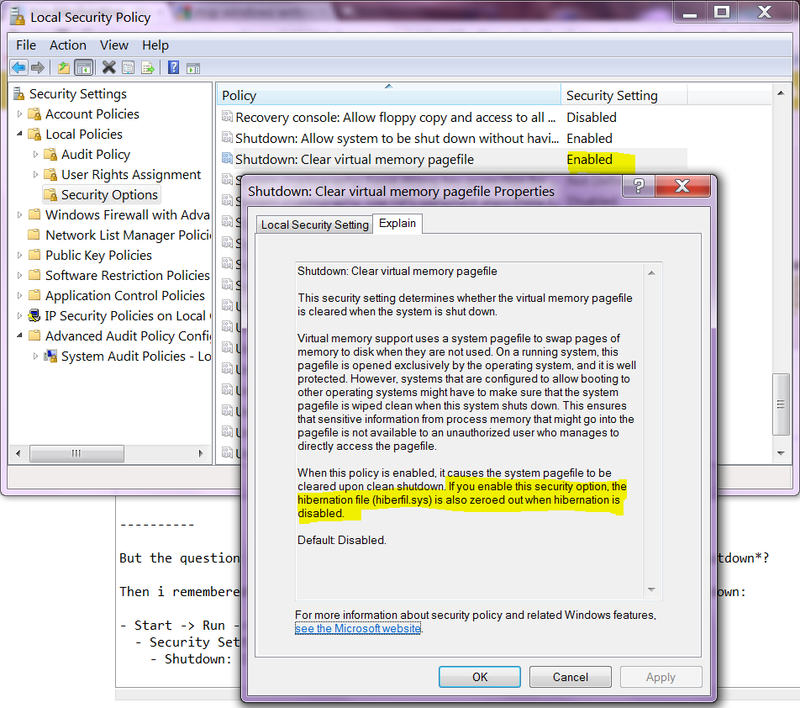 Browse other questions tagged windows performance shutdown or ask your own question. How do I troubleshoot a Windows freeze or slowness? How to see what's going on during Windows shutdown/logging off process? How do I troubleshoot a Windows 7 freeze or slowness? Why are Windows 7&8 so much slower than Linux Mint on the same SSD? Culprit of my slow system? How to know what Windows 7 is doing before shutdown/reboot? How to force only shutdown after accidentally pressing restart?